tuvar dal recipe - lightly spiced and delicious punjabi arhar dal fry recipe made with pigeon pea lentils or yellow lentils. pick and rinse the lentils very well. add the lentils along with water in the pressure cooker. add finely chopped onion, ginger and turmeric powder. stir and pressure cook for 8 to 9 whistles till the dal has become completely cooked and is of consistency which can be mashed easily. mash the dal with a spoon or wired whisk. keep the cooked dal aside. if the dal appears thick, then add some hot water and keep aside. heat oil in another pan. add the tej patta, cloves and cumin seeds. first fry the cumin till browned. then add the garlic and saute for 10 to 12 seconds. add the chopped onion and fry till transparent or light brown. add the green chilies and saute for some seconds. add turmeric powder, red chili powder, garam masala powder and asafoetida. stir and then add the tomatoes. saute till the tomatoes become softened and you see oil leaving the sides of this base onion-tomato masala mixture. lastly add the crushed kasuri methi (dry fenugreek leaves) and saute for a few seconds. pour this tempering in the cooked dal. add 1 tbsp butter or ghee (optional) and salt. you can add some water here if required. 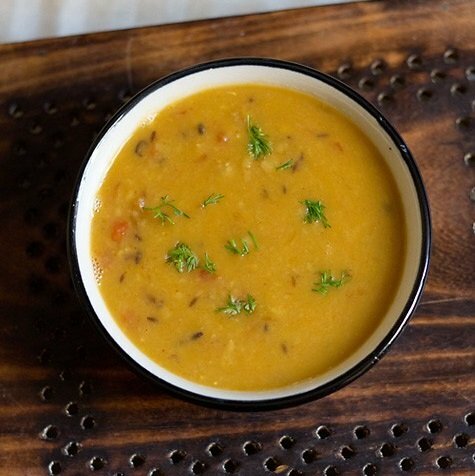 stir and simmer the arhar dal for 5 to 6 minutes or more till it reaches a slightly thick consistency. you can even keep medium consistency of the dal if you prefer. if you want a slight sour taste in the arhar dal fry, then add a few drops of lemon juice or ½ tsp of amchur powder (dry mango powder) towards the end. if adding dry mango powder, then stir well and allow the arhar dal to simmer for 1 to 2 mins after adding it. garnish with coriander leaves and serve the arhar dal fry hot with steamed basmati rice or jeera rice or naan or rotis accompanied with roasted papad and a pickle or salad by side. rinse and soak the lentils for an hour. drain and add them to a pot. add 2 cups water, onion, turmeric and ginger. add a few drops of oil as this reduces the frothing in the lentils. stir and cover and cook the lentils. bring to a boil and then simmer till the lentils are cooked really well. if too much water has evaporated, then add some more hot water and continue to cooking.